We want YOU for the Theodore Primary School board! If you're keen to contribute to the governance of Theodore Primary School, you should nominate for a position on the board. No prior experience is necessary. Meetings are held twice per term at 3.30pm on Thursday and run for around 1 hour. Parents and carers, school staff and students (in years 5 to 12) will be asked to participate in these important surveys. The survey results will contribute to school research and improvement processes. Although the survey is voluntary, we hope you will want to participate. It won’t take much of your time and will help us improve our school for your child and future students. A letter or email about the parent and carer survey will be sent to you in August. The key ACT results from the 2017 School Satisfaction Surveys have been published on the Education Directorate website (www.education.act.gov.au) and a summary of our school results is provided in our 2017 School Board Report. Theodore Primary School as we celebrate the importance and joy of Mathematics. With the new Sentral system upgrade the school will be moving to SMS absence notifications from Term 3. If your child/ren are away from school you will be sent an SMS notifying you that they are absent from class. This will replace the current email process already in place. The SMS will be sent to the first priority contact listed on your child\ren’s enrolment paperwork. Please see the front office if you need to amend these details. Enrolment applications for term 1 of 2019 open on Monday 30 April 2018 and must be submitted online at https://form.act.gov.au/smartforms/landing.htm?formCode=1087. All ACT children are guaranteed a place in an ACT Public School, from preschool through to college. Information about the enrolment assessment criteria and priority enrolment areas can be found at https://www.education.act.gov.au/school_education/enrolling_in_an_act_public_school. If you are applying to enrol in preschool, year 7 or year 11 we ask that you submit your application by 4 June 2018 to support timely processing and school planning. From 30 June 2018, after the application has been processed, parents/carers will commence receiving advice from the school on the enrolment. Please note, that the order in which applications are received is not a factor in schools determining places and as a result, there is no requirement to submit your application form on the first day applications open. Every day across Canberra, parents are parking illegally in school zones and putting all kids in the area at risk. With school parking patrols increasing in 2018, if you keep doing it, you will get caught and you will be fined. Theodore Primary School Board 'We want YOU' for the Theodore Primary School Board! If you are keen to contribute to the governance of Theodore Primary School, you should nominate for one of three vacant parent representative positions on the board. No prior experience is necessary. Meetings are held twice per Term at 3.15pm on a Wednesday and run for around 1 hour. Nomination Forms can be collected by contacting Rose Rodriguez on 61423100 or Rose.Rodriguez@ed.act.edu.au on Monday 5 February 2018 to 19th February 2018. BOOK FAIR IS COMING SOON!!! All Book Fair purchases benefit OUR school. This year our annual student concert will be followed by a fabulous food fair! It will be a night of music, food, and fun, allowing the whole school community to come together and celebrate the achievements of our students in 2017. The event is also a major fundraiser for new outdoor play equipment. There will be a range of food available including baked potatoes, butter chicken, vegetarian curry and rice, BBQ (sausages, kranskys, steak sandwiches), Dutch poffertjes, ice creams and drinks. There will also be a raffle drawn on the night with some amazing prizes. SRC PJ Day Fundraiser on the 20th of September, Theodore hosted a PJ day and raised $300. We are very happy with the success of the day and happy to know that all of the money raised will go directly to the RSPCA to help animals like Fox and Bobby. For anyone who wants to adopt a pet you can go to https://www.rspca.org.au/adopt-pet. School online orders choose from a great list of lunch options and pay online – all without the last minute morning hassle. The Public Place Café, a local based business, is providing and delivering the food using the best quality ingredients. They are very amenable to menu changes and welcome suggestions if you would like to see something new. To place your order visit http://www.schoollunchonline.com.au/, register your family and then follow the prompts to choose your lunch selection and place your order. You will need to register before you can view the menu as each school has a different menu. It only takes a minute or two to register and is very simple. Simply click on the calendar on any Thursday to view the menu. Next Friday will be our annual Great Book Swap fundraiser. Students who wish to participate need to drop in a pre-loved book to Miss White before or on the morning of the 15th September. At recess time the students who have brought in a book will meet Miss White in the Library to swap their pre-loved book for a new pre-loved book. As it is a fundraiser all student who wish to participate in swapping a pre-loved book will be asked to donate a gold coin. Parents are invited to come along and see all the great work their child/ren have done throughout the term. In conjunction with our Book Week celebrations, Theodore Primary will be having our Pyjamas and Hot Chocolate evening. This a wonderful opportunity for children to wear their pyjamas, have a cup of hot chocolate and read a variety of books as a family. The 2017 School Satisfaction and Climate Surveys will OPEN on the 8th August and will be open until 28th August 2017. Parents and carers, school staff and students (in years 5 to 12) will be asked to participate in these important surveys. The survey results will contribute to the school improvement process, which aims to achieve high standards in student learning, innovation and best practice in Canberra public schools. Although the survey is voluntary, we hope you will participate as we really value your feedback. It won’t take much of your time and it will help us understand areas where we are doing a good job and areas for further development. A letter or email about the parent and carer survey will be sent home on Tuesday 9th August 2017. The key ACT results from the 2016 School Satisfaction Surveys have been published on the Education Directorate website (www.education.act.gov.au) and a summary of our school results is provided in our 2016 School Board Report. We want your feedback, last year we received 100 surveys, this year we are aiming for 150. The challenge will be once the survey has been completed for your child to return the completed slip. The class with the most returned slips will have a TREAT with Mrs Stewart. As part of our Book Week celebration this year, Theodore is holding a writing competition. So it’s time to fine tune your imagination and get ready to write. The theme for our writing competition is ‘Escape to Everywhere’. Please clearly write your name and class on the top of your entry. 3. You’re done!! It’s that easy!! NOTE: Maximum length is 1 page (approximately 800 words). Completed entries can be hand written or typed. Come and join in a great night of fun and food at Theodore Primary School as we celebrate the importance and joy of Mathematics. Information for NSW residents applying for preschool in 2018. All applications from NSW residents for preschool in 2018, regardless of when they are submitted in 2017, will be held by the first school listed on the application and considered in 2018. If you have any queries about this process please call the ACT Education Directorate on 6205 5429. Information for NSW residents applying for kindergarten to year 6 in 2018. Applications from NSW residents for kindergarten to year 6 will be processed in the Initial and Subsequent Enrolment Consideration period as per the timeline on the Education Directorate’s website. If you have any queries about this process please call the ACT Education Directorate on 6205 5429. The Kindergarten teachers will present an outline of the Kindergarten program and there will be opportunity to visit the Kindergarten classrooms after the presentation. If you are unable to attend but would like more information about Kindergarten for 2018 please do not hesitate to contact the school. Theodore Primary School now enrolling. If you have a child you would like to attend Theodore Preschool / Primary in 2018 please ensure you complete an enrolment form online. If you would like to discuss your child's enrolment with the school's Principal, please phone 02 61423100 to arrange a meeting. This is a great opportunity to meet your children's teacher and other members of our community. The school will supply Sausage Sizzle Sandwiches. Are you interested in bringing your child/ren to a playgroup at Theodore Primary School on Wednesday mornings? Have fun with your child as we sing, play, read, laugh, talk and enjoy being parents. The playgroup will be run each week by a qualified teacher and all are welcome from babies, toddlers, pre-schooler through to parents, grandparents and carers. Playgroup is held at Theodore Primary School in the BILBIES Preschool Unit on Wednesday mornings from 9.00am to 10.30am. Playgroup commences Wednesday 8th February 2017. For more information please phone 61423100. We want YOU for the Theodore Primary School board! If you're keen to contribute to the governance of Theodore Primary School, you should nominate for one vacant parent representative position on the board. No prior experience is necessary. Meetings are held twice per term at 3.15pm on a Wednesday and run for around 1 hour. • Develop, maintain and review curriculum for the school and approve the school budget. Nominations forms will be available from the Front Office. All staff at Theodore congratulate Matt on a great achievement !!! Listen to Matthew Holdway's interview with ABC Breakfast Radio on Friday 4th November 2016. The 2016 School Satisfaction Survey for Parents and Carers is now open. If you have not already completed the survey, please complete the survey by Monday 29 August 2016. A letter about the parent and carer survey was emailed to parents and carers or sent home with students. If you do not have a letter for each child in your family, please contact the school office. The letter contains all the information you will need to access the survey. The key ACT results from the 2015 School Satisfaction Surveys have been published on the Education Directorate website (www.education.act.gov.au) and a summary of our school results is provided in our 2015 School Board Report. Thank you in anticipation of your participation in this important school survey. Please note, a shortened version of the parent and carer questionnaire is available in the following languages: Arabic, Burmese, Chinese, Dari, Dinka, Farsi, Hindi, Karen, Korean, Mon, Urdu and Vietnamese. Please contact me if you would like a copy in any of these languages. Thank you again for your help with these important surveys. We want your feedback. Last year we received 100 surveys. This year we are aiming for 150. Once the survey has been completed your child should to return the confirmation slip. The class with the most returned slips will receive a TREAT with Mr Holdway. The aim is to gather information about the school’s social climate, day-to-day experiences, the strengths of the school, and the future challenges. This survey will take place this term (Term 3, 2016). You will receive an e-mail from the school with a link to the survey and students will complete the survey at school. We hope to be able to discuss the findings of the survey with you at a future time and feel that gathering this information annually is important in ensuring the quality of the relational and wellbeing climate of the school for staff, students and parents/carers. 2016 School Satisfaction Surveys will be conducted later this term. Although the survey is voluntary, we hope you will want to participate. It won’t take much of your time and it will help us understand areas where we are doing a good job and areas for further development. A letter or email about the parent survey will be sent to you in August. The key ACT results from the 2015 School Satisfaction Surveys have been published on the Education and Training Directorate website (www.det.act.gov.au) and a summary of our school results is provided in our 2015 School Board Report. We want your feedback , last year we received 100 surveys, this year we are aiming for 150. The challenge will be once the survey has been completed for your child to return the completed slip. The class with the most returned slips will have a TREAT with Mr Holdway. Time in the library where we all share books and enjoy a warm drink. Come along and enjoy seeing and hearing some wonderful books. Children of all ages and experience levels invited to participate in a non - competitive just for fun dance class focused on making friends while learning new skills. Come and join in a great night of fun and food at Theodore Primary School as wee celebrate the importance and joy of Mathematics. What: Yummy Pizza to eat after you participate in Maths games and activities. As you are all aware voluntary contributions help provide our school with extra resourcing that supports the enrichment of your child’s education. This funding allows us to purchase additional resources and or provide additional learning opportunities for your child. In past years the School Board has set the voluntary contributions and did so again at the start of 2015. Please note, you are able to contribute more or less if you choose. These contributions are from Preschool to year 6. Of course, you can still pay the amounts above and we would be very appreciative of this. Kindy to year 6: Money collected through voluntary contributions this year will help to create richer classroom environments and may include painting of walls, purchase of display materials and or furniture as well as upgrades to technology. Preschool: Money collected through voluntary contributions this year will contribute to the construction of a new shade shelter for over the swing set. 2017 STUDENT ENROLMENTS OPEN !! 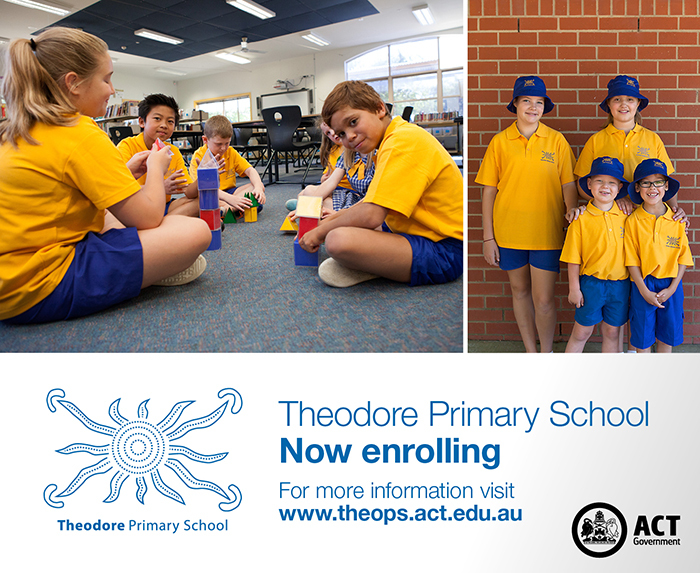 Student Enrolments for Theodore Primary and Theodore Preschool 2017 are now OPEN . If you have a child you would like to attend Theodore Primary or Theodore Preschool in 2017 please ensure you complete an enrolment form as soon as possible. All enrolments for Preschool to Year 6 are to be completed online please go to - www.det.act.gov.au. If you would like to discuss your child's enrolment with the schools' principal Matt Holdway please phone 6142 3100 to make an appointment. Students from Preschool to Year 6 will participate in the 2016 Chief Ministers Reading Challenge. On Friday 6th May we will be having our Grandparent’s Day as part of our History unit. We would like to invite our student’s grandparents to come in to Yackatoon from 9:30am and talk to our students about what their life was like when they were young. We want our students to realise the changes that have occurred in the lives of people that they know. Students will ask questions about school, home, food, books, transport and other topics of interest. If your child’s grandparent/s have an item they would like to bring along to show the students that would be fantastic. Enrolments for Theodore Preschool 2017 will open on Tuesday 26th April 2016 . If you have a child you would like to attend Theodore Preschool in 2017 please ensure you complete an enrolment form as soon as possible. All enrolments for Preschool to Year 6 are done online please go to - www.det.act.gov.au. Alex Yialeloglou entered the Royal Canberra Show Cooking Completion during February 2016. Well done Alex a fantastic effort all round. Parents and other adults who volunteer, or work in some paid capacity at school, are required under the Working With Vulnerable People Act to be registered with Access Canberra. There are however some exemptions. Those who registered in 2013 will need to apply to renew their registration during 2016. If your card is over three years old it has probably expired and you cannot lawfully have contact with children as a volunteer or visitor in a school-related activity. If you are uncertain, you should contact Access Canberra on 13 2281 or accesscanberra.act.gov.au, or in person at an ACT Government shopfront. If you think you may be exempt under the Act, you should contact the school. Registration for (unpaid) volunteers is free. Registration for employees and paid visitors is $76 for three years. Please note children will not be able to access the canteen on the day. We would like to welcome back all our students and families to begin a new year at Theodore Primary School. Please see details for starting dates and times for Preschool to Year 6 and also a few reminders. All kindergarten children assemble in the school hall on arrival to meet their teacher and class group for 2016. New students in year 1 to year 6 are welcome to come to school for a short time, with their parents, to meet their teacher and be shown to their new classroom. They will then start fulltime on Tuesday 2nd February 2016. Year 1 to year 6 students, assemble under the shade shelter to meet their teacher and class group for 2016. Students Medication - Please return your child's updated medication and action plan to the front office labelled in a plastic bag on the first day of school. If your child has developed any medical condition over the school holidays please contact the front office on 61423100 to discuss further first aid for your child. Chalk Education will be at the school hall on Tuesday 2nd February from 2.30pm to 4.00pm if you would like to order a book pack for your child. We look forward to a successful partnership between yourselves and the school to achieve the best outcomes for your children.